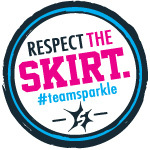 I love this graphic from S.B.LATTINDESIGN. I always seem to be missing the measuring cup or spoon I need. And the next time I cook or bake, it's back and a different one is missing. Go figure! Not only is it useful, it is a cool design. 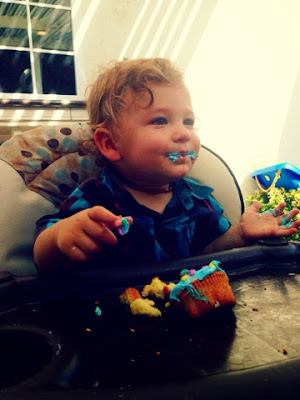 My cute little nephew turned one and we celebrated with a family party. My mom made the most adorable cake for him! 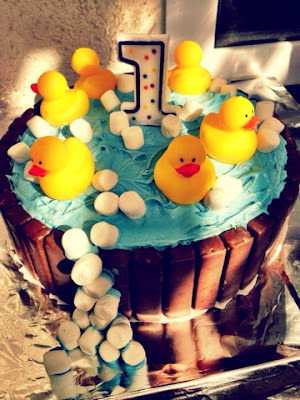 She used chocolate wafers for the outside of the washtub, marshmallows for the bubbles, and blue frosting for the water. 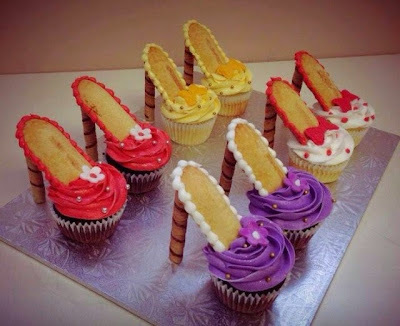 Dreyer's Ice Cream recently posted this photo of ice cream cupcakes on their Facebook page. I've never tried making ice cream cupcakes, thinking they would be too complicated. But after seeing this inside view, maybe they wouldn't be impossible to make. 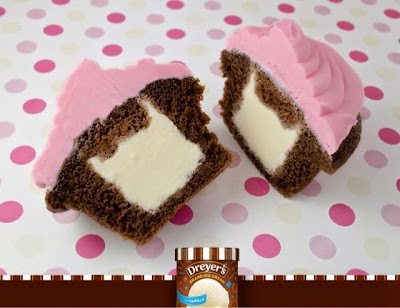 According to Dreyer's, after the cupcakes cool, cut out the middle of the cupcake and fill with ice cream. Put the top back on and freeze. When the cupcakes are ready to be eaten, frost and enjoy! One of the favorite parts of my job (aka: owning my own business) is the opportunities I get to travel. Last month my work took me to Myrtle Beach, South Carolina. This was my first visit to South Carolina and I made sure to make the most of it. I ate at a delicious cash-only burger bar, the "best Thai in town," and of course the local cupcake shop. Coccadotts has four locations: Albany, NY, Clifton Park, NY, Loudonville, NY, and Myrtle Beach, SC. 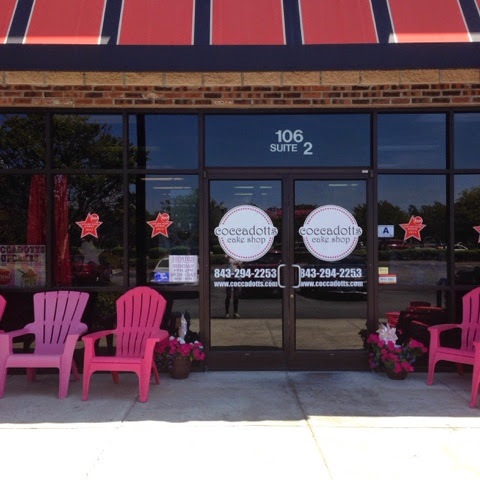 I knew I had to visit them because Coccadotts won Cupcake Wars in 2013. The problem with Coccadotts is that they had 40 flavors to choose from! My stomach is only so big. After staring at my choices for a few minutes, I finally made my decisions. Sea Salt Caramel: Vanilla cake with vanilla frosting, topped with salted caramel drizzle. 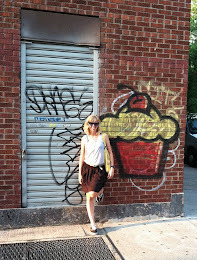 This cupcake was a bit plain to me, but I'm not a vanilla vanilla fan. The drizzle made it a bit more interesting, so I'm glad it had that. Snickas: Vanilla cake with chocolate icing, topped and filled with Snickers chunks. I was hoping for a more thick chocolaty frosting, but this one was whipped, light, and airy. My favorite part was the chunk of Snickers in the middle. Shirley Temple: Cherry flavored cake with cherry champagne buttercream, topped with cherry filling, a dollop of buttercream, and a cherry. I loved the meld of flavors in this cupcake. Very unique. The frosting was a bit too sweet for me though. 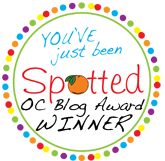 OMG: Saved the best for last! 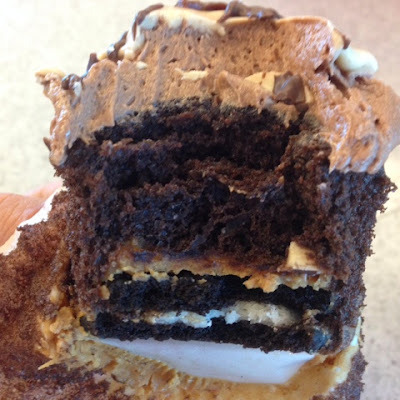 Let's start the description from the bottom up: a whole Oreo cookie, a layer of peanut butter, chocolate cake, topped with chocolate buttercream, then dipped in white peanut butter chocolate (see below). Not kinda amazing, but over-the-top AMAZING! I knew this cupcake was trouble, but I ate the whole thing anyway. So worth it!! There are a lot of good qualities about Coccadotts: variety of flavors, low cost ($2.50 per cupcake), and good-looking decorations. 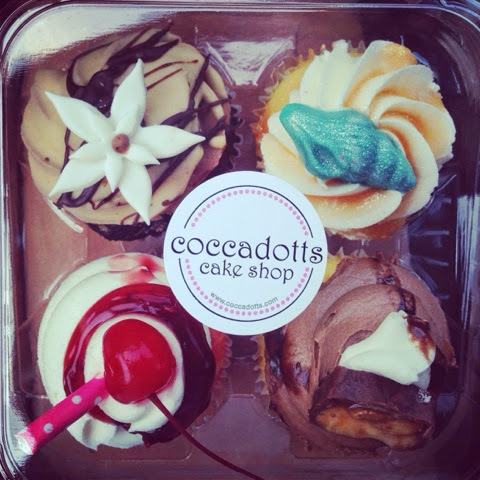 There are way too many cupcakes to try, so I'll definitely be heading back to Coccadotts the next time I'm near one.